It'll be 9C today, if the weather people are to be believed, and since it was warm enough yesterday for Mini to forgo wearing her jacket, I figured we should start to make the transition to spring outerwear. So, I went into the bowels of my home and brought up the spring/summer jackets and shoes. They all still fit for the most part, except for Lam's rain boots. Too small. Bummer, really, because his not wanting to wear his snow boots to school anymore was actually the catalyst for this event. Again, bummer. Mini, on the other hand, is in rain boot heaven. 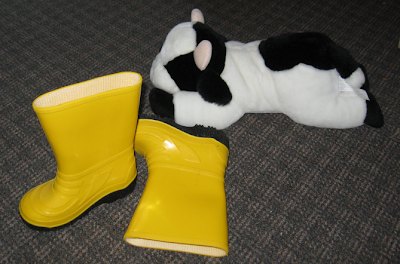 Her yellow boots finally fit, and she's been wearing them around the house. "Look, Mommy, my boots fit! I'm a big girl, right?!" You know, it's transitions like these - going from winter to summer and vice versa - that frustrate me. We now have two sets of outer wear in our closet because Winnipeg weather is very fickle until about, oh, June, when it allows us to put our parkas in storage. Friends south of the equator are experiencing their seasonal transition too. So, are you all suited up for the new season? Not yet? Have been for weeks already? We've been w/o the snow boots for a while now, as the Trifecta like to "experience" the snow as it is melting (translation: swim in puddles/ crunch through the ice, as applicable - just like their mom did!) It is difficult to dry snow boots after a "booter", so I pulled out the rubbers a couple of weeks back. The reaction was similar ("yaaaaaay!") but I was just noticing today that everyone seems to have 2 or 3 pairs of footwear by the door. Multiply that by five and you have... ugh. Transition. BUT the grass is peeking through - through the dog poop, but peeking nonetheless. Soon will follow the tulips! my monkeys always just had their pants over their winter boots, so the pants would get wet, not the boots. I planted a couple of prairie crocus late last year... we'll see if they come up. I'd like to plant them throughout the lawn. Either that or just get rid of the grass in the front. Then it could be all tulips and crocus! I need to get N some rubber boots. He is starting to like the idea of walking outside. I LOVE the idea of crocus in the lawn! :) Can't wait to see that!